In 680 CE, less than fifty years after the death of Prophet Muhammad, an army of over thirty thousand men was deployed by thirty-three-year-old Umayyad Caliph Yazid to confront a tiny group of seventy-two people led by the prophet’s grandson, Hussein ibn Ali, who had challenged the legitimacy of the Umayyad hereditary rule as un-Islamic. In the resulting battle that took place in Karbala on the banks of the Euphrates in modern Iraq, Hussein and his companions were martyred almost to the last man. Following the battle, his kinswomen, belonging to the house of the prophet, and their children were taken in captivity to Damascus, the capital of the Umayyad caliphate. This was the seminal event in the history of early Islam that led to the consolidation of the political identity of the Shia (Partisans) of Ali, the prophet’s son-in-law, Hussein’s father, the fourth of the righteous caliphs, and now, posthumously, the first Imam of the Shia. Theological differences between the Shia and those who upheld the legitimacy of the Umayyad dynasty, despite its usurpation of the Caliphate (who came to be known as Sunnis three hundred years later), emerged during the next couple of centuries. Religious schism clearly followed political schism and not the other way around as is commonly assumed. 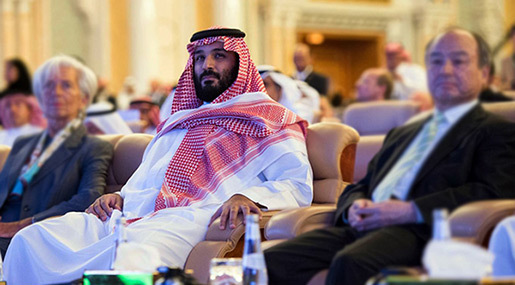 The current inheritor of Caliph Yazid bin Mu’awiyya’s political mantle is Mohammed bin Salman (MbS), the impetuous crown prince of Saudi Arabia, who is also thirty-three years old. He seems to be currently promoting a fight to the finish with the Shia in the Middle East just as Yazid did in 680 CE. Keeping in mind the balance of forces in the region, especially between Saudi Arabia and the leading Shia power Iran, he has chosen the Lebanese Hezbollah as his first target. He seems intent on repeating the story of Karbala by destroying Hezbollah, a military pigmy compared to the armed might of Saudi Arabia, just as Yazid’s forces had destroyed Hussein’s miniscule band of followers in the seventh century. The forced detention by Riyadh of former Lebanese Prime Minister, Saad Hariri, is but the first shot in this battle. Hariri’s main crime in Saudi eyes was that, while being bankrolled by Riyadh, he accommodated Hezbollah as part of a national unity government in Lebanon. Hariri did so in order to minimize sectarian antagonism that had been once again growing in the country thanks to the sectarian color in which the Saudis and their Western supporters had painted the war in neighboring Syria and to Hezbollah’s participation in that conflict on the side of the Syrian government. Moreover, excluding Hezbollah from government would have made Lebanon ungovernable given Hezbollah’s military strength, which is miniscule when compared to Saudi Arabia’s military strength yet has surpassed that of the Lebanese army. It also would have put into jeopardy the political support that Lebanon commands among the Lebanese Shia, who form just under half of the Lebanese population. Hezbollah is seen by the Saudi regime as a surrogate for its real enemy, Iran, with which it is locked in a no-holds-barred contest for dominance in the Persian Gulf. MbS’s actual goal is to cut Iran down to size and make it accept Saudi hegemony in the Persian Gulf. Just as Hussein’s refusal to accept Yazid’s authority was seen as a challenge to the latter’s religious and political legitimacy in the seventh century, today the Wahhabi House of Saud feels its religious legitimacy is at stake as long as Iran, the leading Shia country, which also projects itself as the model Islamic state, refuses to accept it as the predominant power in the Persian Gulf and the exclusive fount of religious authority within Islam. As was the case in the seventh century, issues of political power and religious legitimacy have become inextricably intertwined in the Saudi-Iranian rivalry today. However, there is one major difference. Iran is a major power in its own right with potential nuclear capability weapons and not a ragtag band of a few dozen followers of Imam Hussein. Moreover, despite the fact that Saudi Arabia’s oil reserves account for one-fifth of the world’s reserves and it can outspend Iran many times over in the short run, its recent attempts at buying influence in the region have ended in failure. These failures include its support for the largely Sunni armed opponents of the Syrian government who have been almost wiped out by Assad’s forces supported by Iran and Russia. Also, Saudi Arabia’s attempt to isolate and quarantine tiny Qatar has not only failed, it has forced Qatar into Iranian arms. Above all, the country’s indiscriminate bombing of Yemen, which is aimed at ousting from power the Ansarullah, has failed miserably. This last venture, supported by the United States, has inflicted untold miseries on the Yemeni people without making a dent on the Ansarullah’s control of much of the country. Finally, despite the expenditure of vast resources Saudi Arabia has been unable to recruit loyal long-term allies in the region that are linked to it ideologically or by means of its soft power. Saudi Arabia’s attempt to export its Wahhabi ideology has, in fact, backfired and put the Kingdom at further risk. Radical offshoots of its extremist religio-political ideology, such as al-Qaeda and “ISIS”, have turned out to be Riyadh’s mortal enemies because they consider it highly hypocritical and insufficiently Islamic. Saudi Arabia may be able to temporarily buy support by spending vast amounts of money but its soft power is negligible if not totally absent in the region. On the other hand, Iran can boast of a successful foreign-policy record in the Middle East despite facing stringent economic sanctions and concerted efforts by major powers to curb its regional reach. Tehran’s influence in Iraq is paramount; Shia groups trained by the IRGC are an integral part of Iraq’s effort to defeat “ISIS”. Its political influence on the Iraqi government far surpasses that of the United States despite the presence of American troops in the country. The Iranian-supported Assad government is fast rolling back opposition forces and occupying territory vacated by “ISIS”. Iran’s influence in Lebanon through its ally Hezbollah is growing and has made the Saudis very nervous as witnessed by the Hariri episode. Reports suggest that control of contiguous territories in Iraq, Syria and Lebanon by forces allied with Tehran and thus providing a safe corridor for the projection of Iranian power in the Levant in the future is increasingly turning the idea of a Shia crescent into a self-fulfilling prophecy. Iran’s alliance with Hezbollah and the latter’s unwavering support for Iranian goals in Syria and elsewhere lies at the base of these achievements. Hezbollah, although a product of the Lebanese context of sectarian civil war and “Israeli” occupation in the 1980s, is simultaneously an ideological offshoot of Khomeinism, which combines Shia religious doctrines with revolutionary fervor. However, the success of the alliance lies in the fact that Tehran does not attempt to control Hezbollah’s every move. Hezbollah is an autonomous Lebanese actor that works in tandem with Iran because their interests coincide; it does not take orders from Tehran. Not only are the goals of the two parties in sync, Iran offers firm support for Hezbollah’s policies within Lebanon and toward “Israel”, which are crafted in south Beirut and not in Tehran. Consequently, the level of trust existing between Hezbollah and the Iranian regime is qualitatively different from that between Riyadh and its regional supporters. The latter is based not on a convergence of goals and Riyadh’s acceptance of the autonomous character of its allies but on a one-way street of financial patronage on the one side and unquestioning obedience on the other. It is this expectation of absolute submission on the Saudi’s part that lies at the heart of the crisis that the GCC faces today where other than among the ruling elites of the UAE and tiny Bahrain support for the Saudi regime is eroding fast. This combination of patronage and obedience also means that the allies’ loyalty to Saudi Arabia dissipates quickly when the going gets rough. Given this constellation of forces, it is extremely unrealistic for MbS and his courtiers to expect Iran to give in to Saudi ambitions in relation to the Persian Gulf and the wider Middle East. The attempt by the Saudi regime to portray its rivalry with Iran in Sunni-Shia terms can also be expected to backfire. The most important non-Arab Sunni country, Turkey, has already moved considerably closer to Iran than it was before the Qatar crisis erupted. Sunni Qatar’s recent defection from the Saudi camp and into Iran’s arms can be read as a sign of things to come in the Gulf region. It is worth noting in this context that Qatar is the only Wahhabi state other than Saudi Arabia and thus would have been expected to demonstrate greater ideological affinity with its larger neighbor. Oman, which already has good relations with Tehran, looks like the next potential defector from the Saudi orbit with Kuwait, which has a 30-40 percent Shia population. MbS’s aggressiveness toward Iran and his deliberately provocative religio-political rhetoric vis-à-vis Tehran are only likely to hasten this process. And, if it comes to a military showdown, the Saudi forces, despite the top-of-the-line military equipment Riyadh has acquired from the United States and its allies, will likely be unable to match the battle-hardened Iranian military and the IRGC, which are well-known for their capacity to improvise in times of conflict. This is why Riyadh is itching to sell its conflict with Hezbollah and with Iran to the United States as a part of the continuing confrontation between the Trump administration and Tehran, thus enticing Washington into a shooting war with Tehran. In other words, as one analyst suggests, Riyadh wants to fight Tehran to the last American. Saudi Arabia’s latest move to build a common front with “Israel” to confront common enemy Iran is also likely to backfire because it will further erode the legitimacy of its claim to be the leader of the Arab and Muslim world. Unless MbS begins to show greater political sagacity very soon, his reckless actions and rash rhetoric will turn out to be self-defeating and could drag the entire region into a major conflagration. The second battle of Karbala between the forces of Yazid and Hussein, which MbS seems to be intent on unleashing, may still occur, but it is likely to end differently than the first battle.